Start by preparing the ribs because they’ll take the longest to cook. Massie bottles his own rub—Paleo Nick’s Super Radical Rib Rub—but he’s got a spice recipe for dressing the ribs if you don’t have his Rib Rub. Next come the sweet potatoes, and lastly the Paleo Q sauce. Massie notes that the dish was popular with fans at the 2014 Reebok CrossFit Games, so he’s sure you’ll love it. 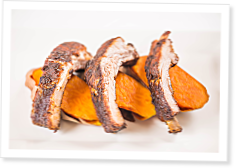 To download the recipe for ribs and sweets with Paleo Q sauce, click here. Looks great though. Keep the good food coming!